Sushi is the iconic Japanese food. The image of sliced raw fish on top of bite-sized rice is deeply associated with Japan. However, its origin story begins somewhere else in the world. And with a very humble beginning. See the infographic below and read in detail after to find out about the history of sushi in Japan and how foreign influences shaped and still affect the art of sushi today. Yes, sushi's story begins in Thailand along the Mekong River. However, because the river also cuts across Cambodia, Vietnam, Laos and China, it's safer to say that southeast Asia is the birthplace of sushi. Flooded rice fields during the rainy season found an abundance of freshwater fish swimming upstream into the paddies. While harvested rice could last for months, caught fish only lasted for days if lucky. In order for the ancient farmers to preserve the fish, they tried coating them in liberal amounts of salt. While effective in slowing down the spoilage, it also created a stinky and slimy goo which would eventually be the forefather of Asian fish sauce. So yes, sushi & fish sauce are cousins in a sense. rice farming has lasted for many centuries with very little change in practice. A second technique was to bury the fish into mounds of cooked rice sealed inside a jar, fermenting the fish and keeping it edible for several months. When it was time to eat, the terrible tasting mushy rice paste was scraped away and discarded, then the fermented fish eaten. Update: On the infographic, it states that rice was imported from Korea in 400 BC. There have been several debates whether it came directly from China instead. Considering the sensitive nature & histories among all three countries, it's best to state that rice came from China to Japan and that Korea could have been one of the routes. The method of preserving fish with fermented rice sweeps into China then proceeds to Japan. By the 8th century, this sushi was considered so special, that the Japanese government accepted it as tax payments. But as it gained in popularity in Japan, it disappeared in China. Why? One theory believes that Genghis Khan and the Mongol horde preferred red meat to fish, and once they conquered China, the culture changed to reflect their conqueror's palate hence hot pot & beef dishes. And this wouldn't be a surprise, because foreign intervention would help create sushi's most popular dish. More on that later. By the 1400s, the process of eating the rice along with the fish became common practice as people began eating sooner in the fermentation process (weeks compared to months). And as always, it was a rich man's dish, so the common people watched from afar as the aristocrats enjoyed their luxury meals. Rice Vinegar helped reduce sushi prep from months to just days. Sushi's first major revolution happens here. Rice vinegar is invented from sake (Japanese rice wine). When added to sushi, it no longer required any fermentation, and it still gave the same sour flavor instantly. This lead to a new version of sushi called haya-zushi or quick sushi. Now freshness in both rice and fish became the standard of eating sushi. Also, at this time, sushi was mostly eaten in Kyoto and Osaka. After the shogun moved the capital from Kyoto to Edo (Tokyo) around 1600, sushi followed. In 1657, the Great Fire of Meireki destroyed most of the capital. During the rebuilding of Edo, many new workers poured into the capital in hopes of catching new opportunities in the city. And they needed something to eat. Food stalls and stands were created to accompany the fast-paced work hours and lifestyle. Hot noodle stands and any other open-flame food were outlawed during dinner hours, because authorities did not want to deal with another potential fire and disaster. Sushi didn't need fire or flames or any other cooking elements. Just fish, rice, and vinegar. It grew in popularity over the next century and became one of Edo's first fast foods. Yes, you read that right. Sushi in a prime Edo (the largest city in the world in the late 1700s) began as fast food. Hello, McSushi. Sushi up until this time was prepared the same way for nearly two centuries. Rice mixed with rice vinegar was spread into a box, layered with fish on top, pressed with heavy stones for a few days, then cut into pieces like a loaf of bread. But that wasn't quick enough. Hand-squeezed sushi (also known as nigiri) changed everything. Now sushi could be made right on the spot. The ability to make sushi everywhere at food stalls, wheeled carts, and other portable makeshifts allowed sushi to spread in popularity throughout Edo. Thus it gave birth to the term Edomae-zushi, a sushi style only made in capital and still affectedly used by sushi aficionados today. Nigiri style sushi would have just been particular to Tokyo only. However, because of the Great Kanto Earthquake of 1923 and World War II, a burnt-down and devastated Tokyo forced many sushi chefs to leave the city, therefore spreading the nigiri-zushi's popularity to become the Japanese tradition it is today. otoro sushi & california roll were invented nearly at the same time. And the American Occupation (1945-52) influenced the Japanese palate to like greasier foods and red meats. This led to elevating tuna (a lowly fish at first) as a prized sushi topping and the holy-grail of fatty tuna belly meat (otoro) as the most expensive piece of sushi served today. 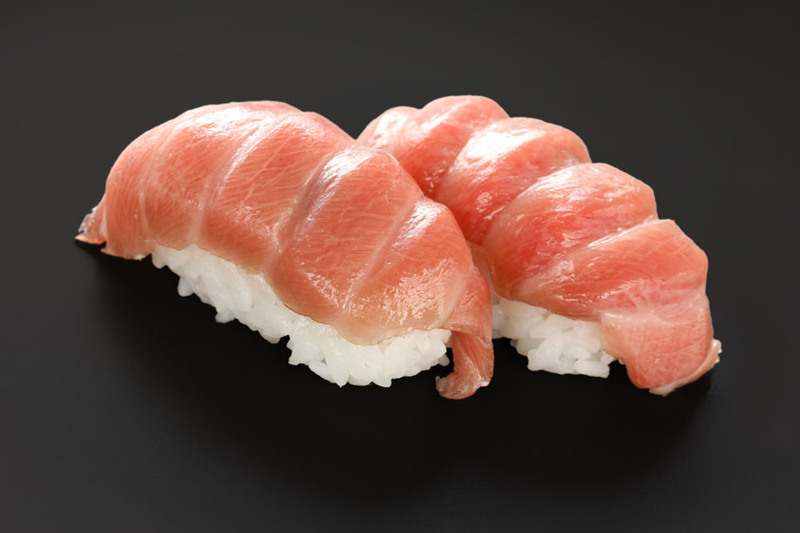 Before western influence, otoro was often considered too fatty for the palate and used as pet food. Yup, cats were living the life back then. Perhaps the one of the better revolutions in sushi's history is the invention of kaitenzushi (conveyor-belt sushi). Before the 1970s, sushi was high-end luxury food, a complete 180 degrees turn from it's origin story in Edo, Japan. Not only that, sushi was a man's world from the chef side and customer side. Kaiten-style helped bring sushi back to its roots, to the everyday people, and better yet, for women to enjoy sushi without the intimidation of a male sushi chef. Now sushi placed on conveyor belts allowed the customer to choose what she wanted to eat in the privacy of her own booth or seat at an affordable price. This is why it's common to see many women staffed at kaiten sushi restaurants. Less intimidation. In many ways, kaitenzushi figuratively pushed through the formality and tradition of sushi bars had become in the 1900s and back to the masses to enjoy a piece of the good life. Still, sushi's evolution and revolution stays strong as it continues it story around the world.